Want to get the most out of your BES® Embroidery Lettering Software program. This workbook is just what you need. Lettering's Sew Easy is the "Easy" guide to learning the BES software program. 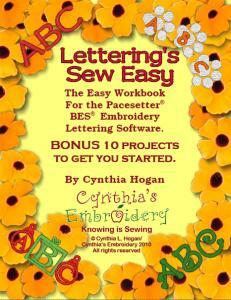 If you are familiar with and love Cindy's Digitizing's Sew Easy workbooks, you will love this one as well. It was created in the same easy to use, step by step format as her previous workbooks. Lettering's Sew Easy walks you through all the basics of the software and includes a BONUS of 10 projects to get you started. 1. Click on the Down arrow next to the Quick Access toolbar and then choose More Commands. 2. At the bottom of the Commands window, click on the Customize Keyboard shortcuts button. 3. In the Categories window, select Home. 4. In the Commands window, select Grid. 5. Click inside the Press new shortcut key box, and then Press the Alt key and the G key on the keyboard. If the shortcut has not been assigned to anything else, it will say Unassigned. If it is an existing shortcut, you will need to select a different keystroke combination. In BES lettering, always use a keystroke with a letter (not the Shift key though) so that the letter is still available for entering text. 6. Press the Assign button. 7. You may now click Close and OK in where appropriate. Sign up for email to see video outlining these instructions. I have been very satisfied with all my orders from AllBrands.